In 2016, a newly created space commerce company initiated work on a Canadian-based launch site for the Ukrainian Tsyklon-4M (Cyclone-4M) rocket. The world's newest spaceport will be located just south of the town of Canso on the northeastern coast of Nova Scotia. The ascent corridor from the launch site will extend south over the Atlantic Ocean opening a new gateway to the much sought-after polar orbit. The dissolution of the USSR in 1991 left a big chunk of the Soviet space potential in Ukraine. However the new independent state lacked its own site to launch space rockets. For much of the first decade of the 21st century, the Ukrainian space agency hoped to get convenient access to equatorial orbit for its Tsyklon-4 rocket from a Brazilian launch site of Alcantara. However by the mid-2010s, the effort collapsed due to a variety of political and economic problems. After the breakup of the Ukrainian-Brazilian venture, the Ukrainian space agency delegated to the KB Yuzhnoe design bureau the search for a new home base for Tsyklon-4. In a March 2017 interview with the UNIAN news agency, Deputy Head of GKAU Vladimir Mikheev said that the company had considered more than 10 different countries for a new spaceport. Experts reportedly looked at such exotic places as Pacific islands and various locations across the United States. In the end, despite the political re-alignment of the Ukrainian government from Moscow toward Washington, US sites were all rejected due to high cost and potential political issues. Instead, developers explored the possibility of putting the rocket in Canada, not unlike a circa 1990s plan to base Russia's light-weight Start booster in Churchill, Manitoba. The home of a large Ukrainian diaspora, Canada maintained good relations with Ukraine and the Canadian political climate looked much more favorable for an international venture. After several trips to Canada and meetings with local authorities, including fishing and environmental regulators, experts at KB Yuzhnoe focused their attention on the coast of Nova Scotia on the east coast of Canada. In February 2017, three US firms formed a joint venture called Maritime Launch Services, MLS, which was based in Halifax, the capital of Nova Scotia. 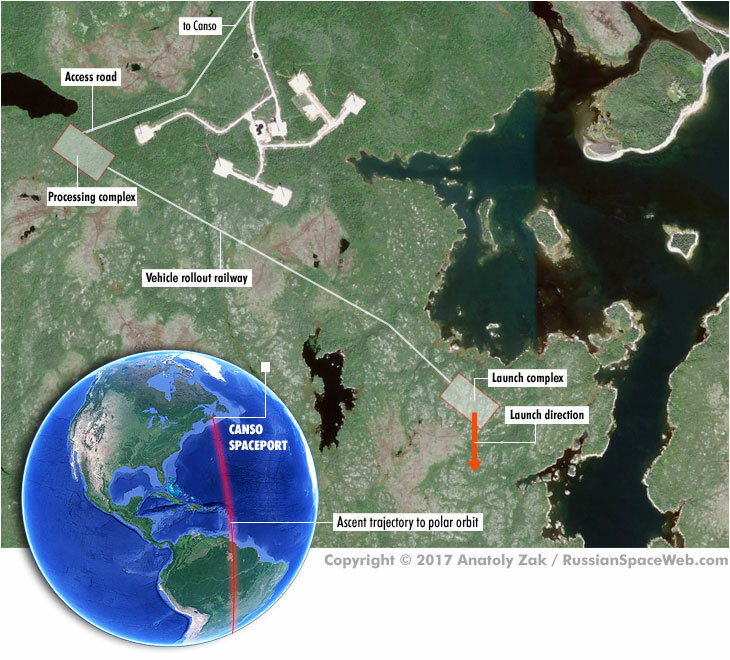 On March 14, MLS announced that it would build a launch facility near Canso and Hazel Hill in Guysborough County, Nova Scotia, for the newly developed Tsyklon-4M rocket. The town located around 300 kilometers east of Halifax, is the home to around 900 people. The company promised to invest between $100 and $110 million of private funds into the project. According to MLS, initial funding for the project was obtained in 2016 from United Paradyne Corporation, UPC, in Santa Maria, CA. Since then other investors have come up with significant amount of cash, sources said. The chosen geographical location enables Tsyklon-4M to deliver 3,350 kilograms of payload into a near-polar Sun-synchronous orbits, when launched southward over the Atlantic, avoiding practically all landmass and populated areas during the ascent to orbit. Up to 5,000 kilograms could be delivered to a variety of low Earth's orbits with an altitude up to 600 kilometers. However, the rocket ascent trajectory from the site would have to be approved by Canadian transportation authorities, taking into consideration the fact that it would be crossing a popular airline route between Europe and North America. The local fishing industry might also impose some seasonal restrictions for launches. Surprisingly, calculations showed that Tsyklon-4M could also deliver nearly a ton of cargo to a geostationary orbit over the Equator, which could potentially be useful for some potential customers. Moreover, the orbit of the International Space Station, ISS, will also be reachable from Nova Scotia, KB Yuzhnoe sources said. However most payloads of the Tsyklon-4M rocket were expected to be remote-sensing satellites focused on the observation of the Earth, monitoring climate, weather and natural disasters, as well as low-orbital communications satellites, such as those expecting to comprise future Internet-delivering constellations. While located in a sparsely populated area, the launch site also presented good transportation infrastructure. The local authorities and population, which had experienced economic downturn due to the declining fishing industry, was reported to be open to the plan. The MLS announcement for the launch site was preceded by an open house with the local residents in February 2017. The company expected to rent the land for the spaceport for at least 20 years. The construction at the spaceport was promised to commence as early as 2018, if the MLS fund-raising effort goes as planned. At least some of the equipment already developed for the Tsyklon-4 rocket based in Alcantara, Brazil, could be recycled for the new space center. According to the company, commercial launches from the spaceport could begin in the fall of 2019 or 2020 and by 2022, Tsyklon-4M could fly up to eight missions per year. The key to the commercial success of the enterprise should be its competitive price reported to be $45 million per launch. On April 11, 2017, a Canadian broadcaster, CBC, published a report on the proposed layout and design of the Canso site, which had been provided by Maritime Launch Services Ltd, MLS, in its November 2016 application to the regional Department of Natural Resources. According to the document, the future space center will consist of two main areas separated by a distance of around 2.4 or 2.6 kilometers. The first site will feature the launch pad and the propellant storage. 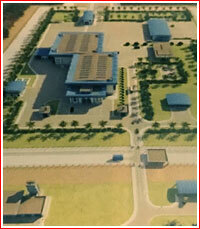 The second area will have the rocket assembly building and the launch control center. The launch control center would be housed in a building between 10 and 15 meters tall. The assembly building and the launch complex will be connected by a custom-built railway for transporting unfueled rockets, as it has been customary for Soviet and Russian launch vehicles. Like most of its Soviet predecessors, the fully assembled Tsyklon-4M will be loaded on a rail-based transporter, which will deliver it to the launch pad, where a special erector will turn the rocket into vertical position and install it onto the launch pad. The spaceport will be connected to the main residential area of Canso by a road, a big part of which also serves a nearby wind farm. According to MLS, most launches would be conducted from the Canso site between 7 a.m. and noon, apparently in order to release the satellites in the correct Syn-synchronous orbit. A typical launch campaign of the Tsyklon-4M rocket is expected to last from a few days to a few weeks, MLS said. The construction of the site was expected to demand several hundred jobs and its operation would require between 30 and 50 full time employees, MLS Ltd. officials said in June 2017. After coming off its assembly line in the city of Dnipro, Ukraine, the Tsyklon-4M rocket will be transported to the Ukrainian port of Odessa, where it will be loaded on a so-called Ro-Ro (roll-on/roll-out) vessel. The transport ship will then sail across the Atlantic, landing at the Canadian port of Mulgrave, where the rocket will be reloaded to a barge heading to a port of Canso. The rocket stages would then be carried by truck to the processing area of the space center. However, by spring 2017, planners began evaluating cheaper option of bringing the rocket directly to Canso if the local port could accommodate such a vessel. In June 2017, Steve Matier, president of MLS Ltd. told the Chronicle Herald that the company was modifying the layout of the spaceport to avoid environmentally sensitive wetlands in the area. MLS hired Bedford-based Strum Consulting to complete environmental risk assessment of the project by the end of 2017.